To properly supply the carburetor and the Sniper System, use a fuel pump designed to operate between 4.5 and 7 psi with a flow rate of 0.1 gallons per horsepower at 6 psi. For example; an engine that produces 350 horsepower when the Sniper System is activated will require a fuel pump that flows at least 35 gallons per hour at 6 psi. *Actual performance gains may vary depending on the engine’s configuration and condition. The engineers at NOS have hit a bullseye by designing the finest entry-level nitrous system available today with the NOS Sniper kit. The Sniper is the economical "entry-level" kit from NOS that simply blows away competitive kits. 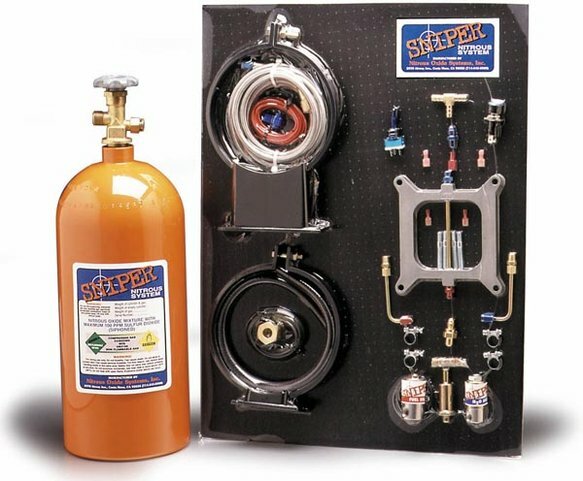 The Sniper was developed to introduce enthusiasts to the use of nitrous at a very affordable price. This system is a safe and reliable street/strip system that fits popular 4 bbl. applications The Sniper is a fully adjustable system that is designed to provide from 100-150 extra horsepower in popular 4 bbl square bore or spread bore applications. However, you can get more than you expected; In dyno tests conducted by Chevy High Performance magazine the Sniper system produced an extra 163 horsepower when installed on a 355 CID small block Chevy with torque increased by an astounding 195 lb/ft. Sniper kits come race ready, right out of the box with all necessary components, including a distinctive bright orange 10 lb bottle with the industry standard industrial valve, adjustable plate with 100-150HP jets, solenoids, plus all required lines, hoses, fittings, clamps and detailed instruction sheet to make installation simple.